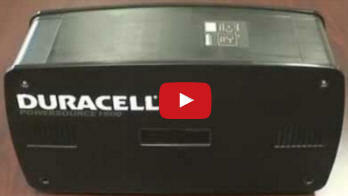 The Duracell® Powersource 1800 is a perfect rechargeable power supply for emergency and backup power. 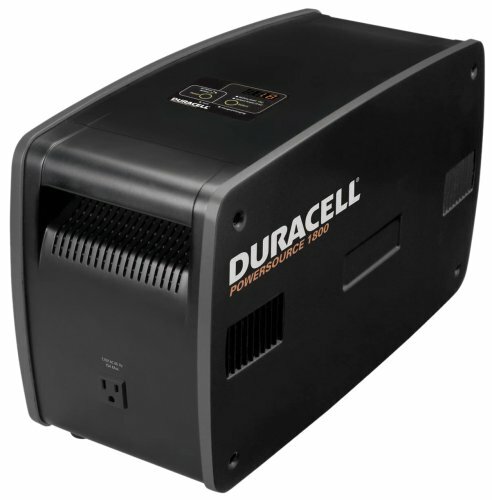 This unique stand-alone power unit is equipped with five AC outlets and provides 1800 Watts of power for TVs, radios, office electronics, laptops, phones, lamps, fish tanks, garage doors, refrigerators, freezers and many other electronic devices. 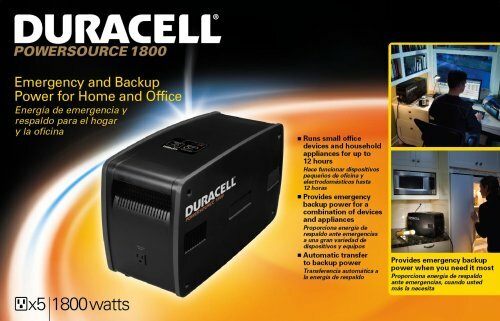 The perfect solution for a power outage or emergency situation, the Powersource 1800 will provide up to 60 hours of run time for many home electronics. The Powersource 1800 will also keep a home office or other combination of household appliances operating for up to 10 hours. The Powersource 1800 will auto-sense when a power outage has occurred and will provide uninterrupted backup power to those devices that are plugged into one of its fi ve 120 Volt AC outlets. When power is restored the Powersource 1800 will automatically switch back to utility power and then it will recharge its internal rechargeable batteries and return to standby mode. The Powersource 1800 is a cleaner alternative to gas-powered generators and is convenient to keep on hand at home or work. Overload and over-temperature protection helps to ensure longer product life and the product carries a one year warranty. 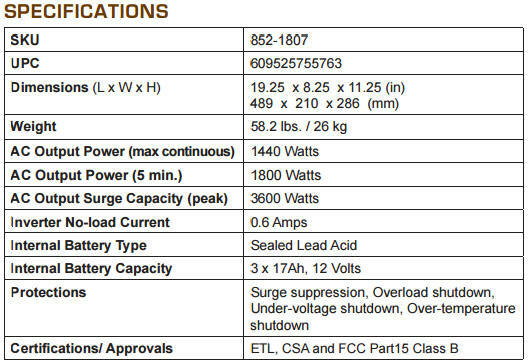 The Powersource 1800 also includes a digital LED display to inform users of its battery capacity and of the total wattage of devices that are connected. 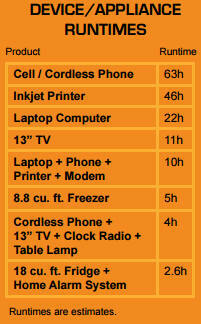 Plus, it will provide power to all fi ve AC outlets simultaneously. It features a bright LED light that automatically illuminates during an outage to provide visibility to the five AC outlets and an audible alarm that will sound to signal ten minutes prior to the unit running out of battery power.